This small and mighty falcon is about the same size as the American kestrel. It’s endemic to Madagascar and the atoll of Aldabra. It prefers open country to forest, and has benefitted from deforestation, nesting under the eaves of homes in populated areas. They usually still hunt from a perch. While they will take mice and small birds, insects comprise 75% of their diet. Thank you for looking at and learning about these wonderful birds with me. Putting together the third of a four panel collection. 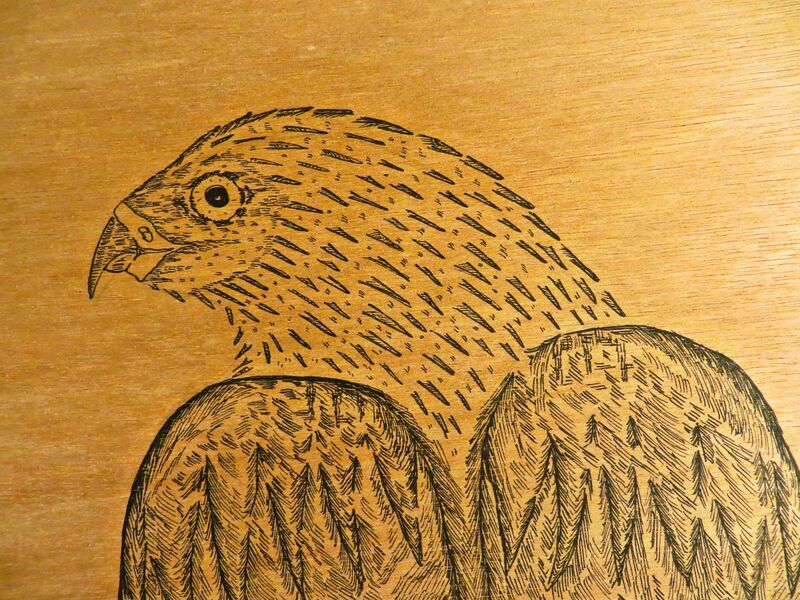 Falcons of North America. 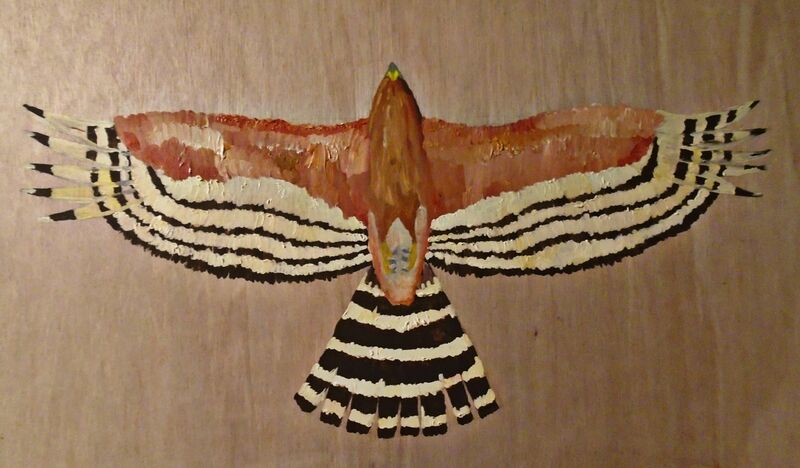 Already completed are the Kestrel and Prairie Falcon. Almost 25% of my goal. Since April 2015. Learning the whole big city thing. I enjoy it more than I expected I would. Slowly unpacking boxes and hanging posters in the new room. 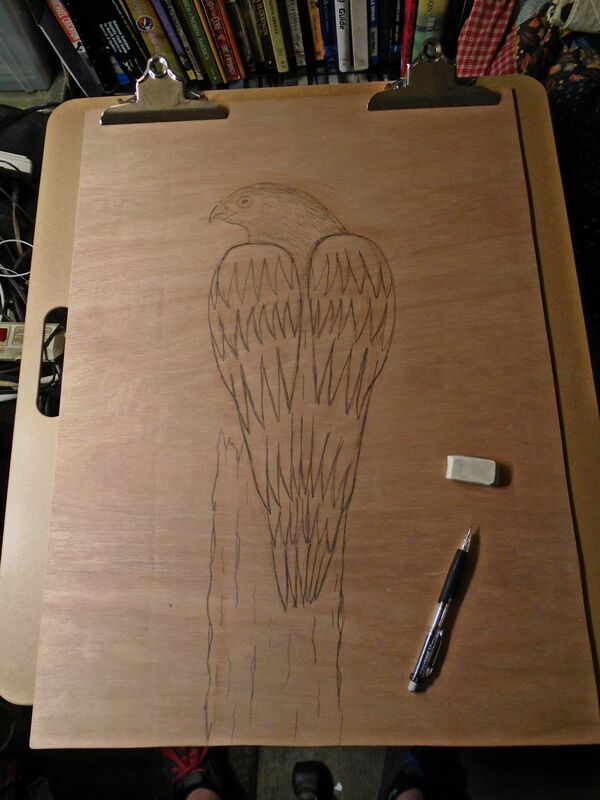 I’ve done a few watercolors since I’ve been here, but I felt it was time for a big sheet of 1/8″ plywood and a large scale project. Sort of my own personal housewarming gift/activity. I’ve been keeping my truck one town over where there’s better parking options so I walked the mile and a half to the lumber yard. I got a great piece of Mahogany 1/8″ plywood for $10. It turns out 7X3 foot sheets are easier to carry in my mind than real life. While I walked the blocks back home through Oakland the wind would catch me like a sail and try and throw me into traffic. I found the whole thing with laughter in my eyes. To walk home with a page so large I almost flew away. 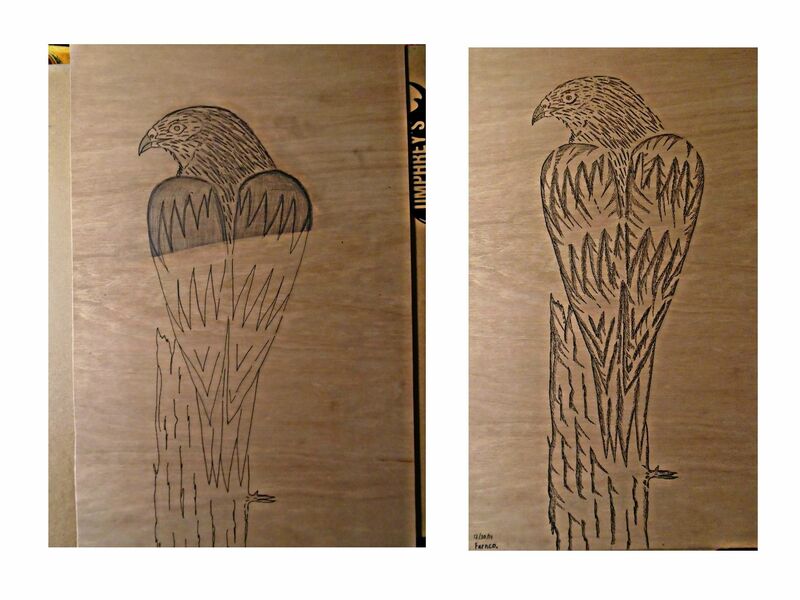 I cut a section off, 3X2 feet for this first Hawk. The remaining larger piece I will start the pencil work for this week. The other day I heard a friend of mine was having some health problems. I said a prayer in my head as I set out on my bicycle to admire the beautiful piece of the planet I inhabit. As I thought of this good for my friend a Red-shouldered Hawk flew right over my head from a tree behind me. Moments later I came across another tree with a pair of Red-shouldered hawks looking down to me on my bicycle. The smile that brought fueled me further and moments later I was face to face with another Red Hawk. I’m not here to preach to you about anything other than the good that is the natural kingdom, but I will say those hawks brought me good hope on their wings. An experience well timed, I am grateful for. 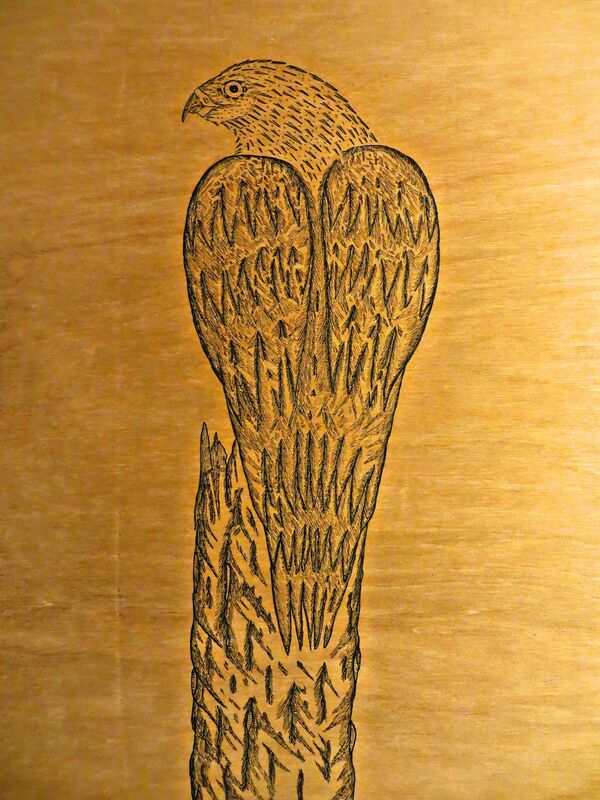 Whatever unfolds down the line from here I am forever grateful to be here to draw birds for you on our planet Earth. If that’s all I’ll do then that’s the best I’ll do. 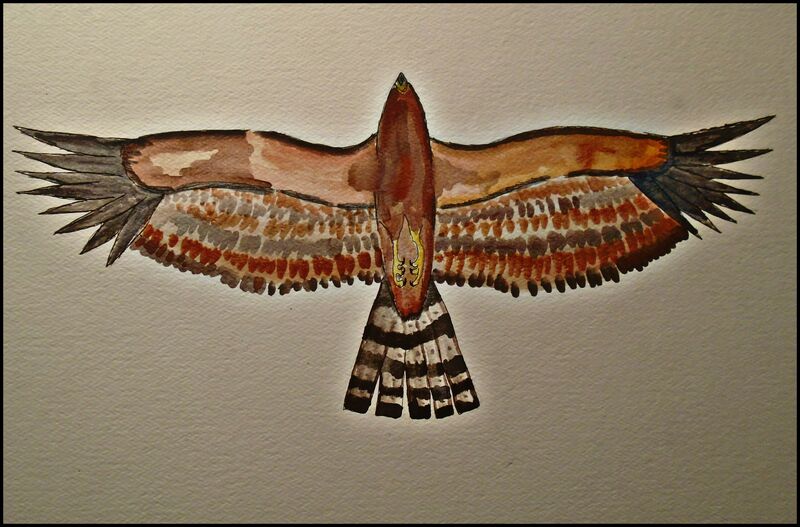 A friend of a friend of mine told me a good story of how Red-tailed hawks remind her of a good friend. They remind me of good friends and family too. So I put this together for her. Penciled in like an appointment I never planned to keep. Turns to splintered sunlight on my page. Hawks help me get lost in the meadow of my imagination.